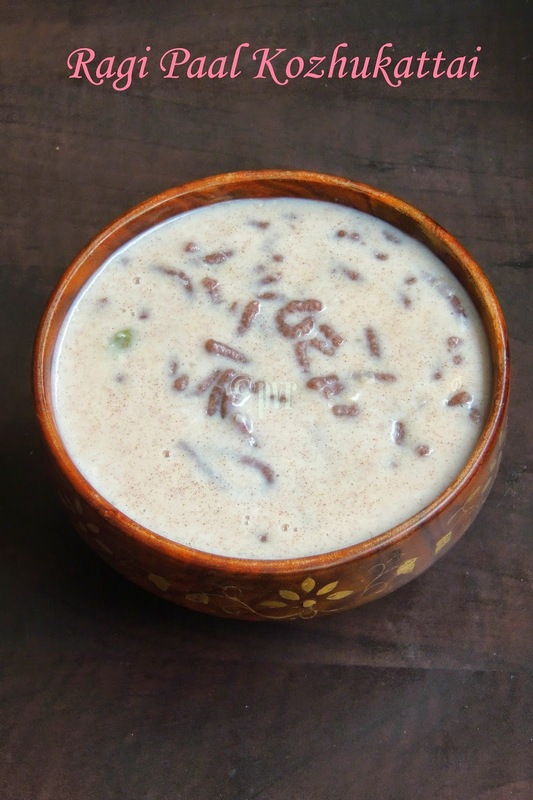 Paal Kozhukattai, this is one among my favourite and now its my daughter's favourite, obviously i'll make this delectable dish often as they are very easy to prepare at home. I have already tried couple of versions with this healthy sweet dish. Paal kozhukattai can be prepared either with milk,coconut milk with sugar or else with jaggery syrup and coconut milk..This time i went for sugar and milk, this healthy ragi paal kozhukattais turned out super delicious.Instead of rolling the dough as small balls, i prepared them with murukku press. When the ragi dough pressed directly to the sweetened milk, gets cooks prefectly and makes this super delicious ragi paal kozhukattais.Sending to Pari's Only - Gluten Free Cooking. Personally i felt so happy when my ragi paal kozhukattais turned absolutely prefect.These kozhukattais can be served chilled or warm,eventhough i love slightly warm kozhukattais..As earlier i again prepared this paal kozhukattais with ragi flour combined with rice flour,you can roll them even as tiny balls as i did earlier here. Follow this easy method of making this finger millet paal kozhukattais if you dont like spending more time in your kitchen,seriously its worth to make this fabulous delicious paal kozhukattais at home.Since am posting Festival recipes as theme for this week's blogging marathon, am posting this beautiful paal kuzhukattais for Ganesh chathurthi.Check out the Blogging Marathon page for the other Blogging Marathoners doing BM#42. Heat a cup of water with salt and oil, take the ragi flour and rice flour in a large bowl,add gradually this hot water and knead the flour as a stiff dough. Take enough dough, drop it in a murukku press with three round nozzle. Meanwhile bring to boil the milk and sugar together in a heavy bottomed vessel,put the flame in simmer and squeeze the dough directly to the hot milk, tilt the vessel gently and cook for 10-15minutes. Once the squeezed dough gets well cooked,put off the flame and add the cardamom powder, give a stir..
healthy and delicious recipe..... will try to make soon. 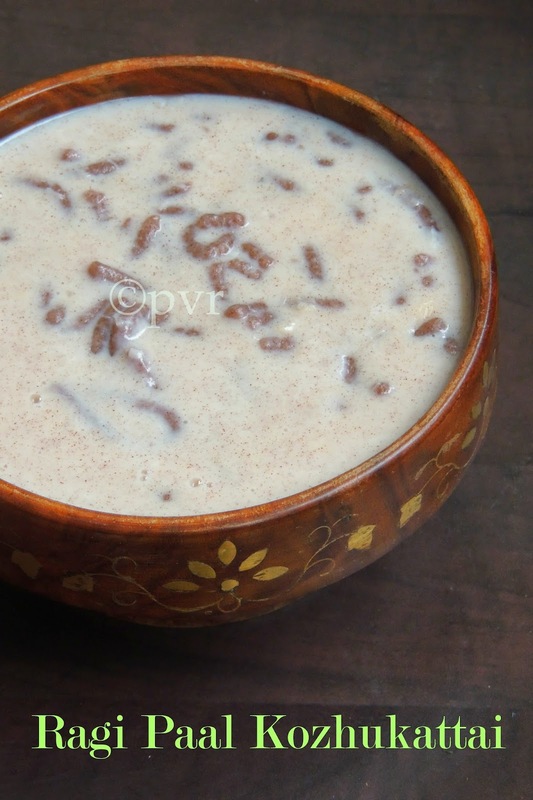 what a healthy treat, ragi paal kozhukattai sounds so delicious...very well done priya! A healthy twist to paal kozhukattai, loving it dear..
Wow that surely looks so delish Priya..never made this with ragi..good one.. Very interesting using ragi flour like this. I like your ragi twist to the traditional dish. Adds a healthy touch to the dish.